Summary: New website design & integration into WordPress - including current content, tools, documents and resources as well as all customer contact forms and touch points. Website Pages – Multiple pages such as Contacts Page, Locations Page, Services Page, Projects Page, etc. Creation of admin-friendly processes and tools for self-managing as many aspects of day to day operations without the need of a developer and designer (where appropriate). We will work with you to create content areas that do not need complicated graphical work to make changes. In short, we always want to try and help code ourselves out of a job. All visitor/customer touch points for communication, request for information follow-up emails and other contact points. Highly skilled and experienced workforce. Our retention rate is phenomenal for the technology industry. Our average employee has 6+ years with our firm and 15 years in the industry. Information architecture and enterprise systems design – we plan for our client’s continued growth and needs 5 – 7 years down the road. Highly experienced with web application development and integration with complex systems. Consultant Experience –Briefly describe your experience in the industry and particularly designing professional, mobile friendly websites for clients. What platform do you use to develop website (Wordpress, etc.)? We fit the platform to each client′s individual needs rather than a one size fits all approach (E.g. WordPress). Typically WordPress is a good choice for content-driven needs. Drupal is great for Application/Feature-driven needs and Joomla! for Community-driven websites. In your RFP - WordPress does seem to be an ideal fit - however, with an enterprise framework overlay (no extra cost to do this) for future integration of apps and features. Project Experience – Briefly list 3 example websites that are similar to our project. Please provide a link to each website for us to review. Trico Construction - features include: HR & job posting management and integration with Recruiterbox, project & markets summaries, vendor document management library & SEO framework. Janicki Industries - features include role-based departmental editing, HR-management of jobs, SEO landing pages for markets & tradeshows, internal employee-only pages. Experience with Application Development –Briefly describe your experience building websites that utilize business applications, such as scheduling applications, project management applications and/or GPS tracking applications Please note if you have developed or assisted in the development of any web applications. We have extensive experience building web apps from start to finish - especially GIS/PM apps. University Mechanical Contractors - we currently maintain and add functions to their project and service management application. Communication –Briefly describe your communication process with clients. Projects will typical involve weekly / bi-weekly stand up meetings with our clients as we work through the specifics. We make use of Basecamp for Project management and/or JIRA for ticket-based issues. Please outline your project process, including project leads and supporting staff. 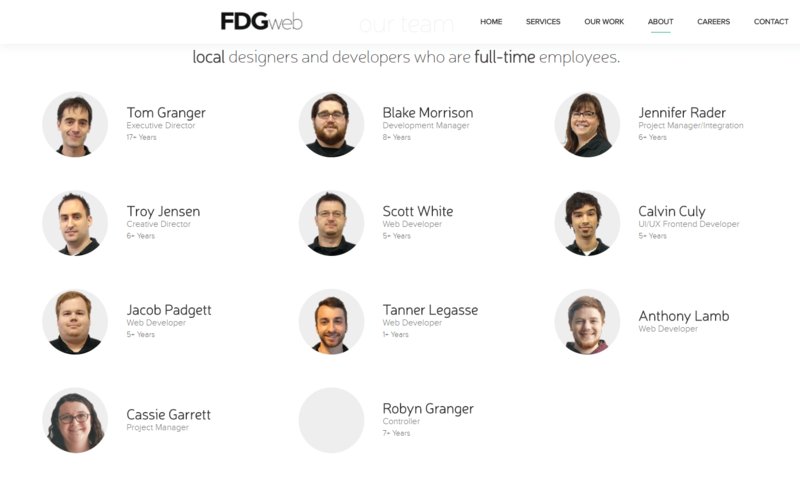 We maintain both a Creative Director and a Development Director who oversee our design & development teams. When a project is first initiated, there will be a Project Manage on our side who will work with your staff to ensure the project′s success. Our project manager will manage FDG staff as needed for the various requirements your project may have. In many cases, the designers or developers will be communicating with you as well when the need arises when it doesn′t make sense to always insert the PM into the process. Professional References –Please provide a minimum of 3 references we can contact regarding your services. Websites and Analytics–Briefly describe your process for ensuring a website has adequate SEO. Please also describe the website analytics that you will establish so we can easily track website traffic. We always make sure each website has a client-controlled set of Google Analytics installed and reporting. Whenever possible, we also like to hook up conversion tracking (e.g. number of contact form submissions) for whatever the call to action is for a particular project. We also install a baseline SEO framework and work with our clients so they can understand how modern search engine optimization works. Since we are far beyond the period of time when optimization at the code level has any real impact on SEO - we make sure we discuss the long term goals for your SEO and help develop a realistic plan that will serve you long term. The owner of our firm attends PubCon, one of the largest annual SEO conventions and master classes and takes a realistic approach to our client′s SEO needs. Outsourcing –Please confirm the services you provide are inu2010house. If not, list what services do you outsource? All of our services are performed by full-time, local staff. No outsourcing. Our clients enjoy being able to talk to people who know their systems inside and out, year after year. Current bid assumes using existing or consolidated content - but with improved organization, message crafting and visual design. Any new content not discussed prior to project inception may require additional work - however, we always will discuss this when you send us new content that doesn′t fit the original scope. (e.g. content that involves new features, such as a new system to integrate or a new registration system). Terms: 33% deposit to start. Progress billing on Net 30. Client should approve and allow for up to 10% extra in final budget for things you may need additional help with or were unknown at the beginning of the project. This is not required, but a realistic expectation as you work through your project. We provide a monthly accounting from our task/billing system so our clients can track each phase of the project. Anything that would fall into the 20% extra allotment would be detailed and approved prior to incurring the billing. Timeline – Sites like this average around 30 - 60 days of design & development time - with content changes often being the portion of the project that can take the most time if you are writing/editing new content. We can use existing content and but a better "polish" on it to help speed the project up.